As I've mentioned in a few posts, when me and my friend Sam are a bit low on funds we like nothing better than having what we call 'cheap days' in Newcastle. This usually involves us going to a museum and acting like excited children. I do really love museums - I have ever since I was a child. On school trips, when other kids would drag their feet and only perk up when it came to the gift shop, I was fascinated by old greek pots, Roman weaponary and the stuffed animals (although the model of a bird caught in an aeroplane wheel would always give me the creeps!). 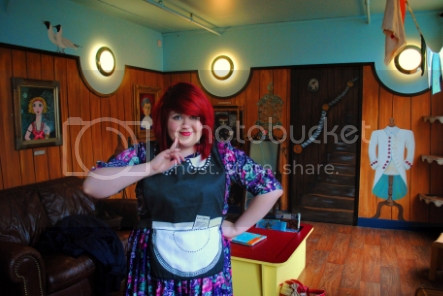 So yesterday we went to the Discovery museum. I hadn't been there since I was a kid, and my dad would take me around on some weekends. I always found the local history a bit of a yawn-fest (the area is rich in Roman history and my home town was even invaded by Vikings - which sounds exciting to learn about, but it's all we heard at school), but I liked the fashion displays featuring regency frocks and tuxedos. My favourite bit was of course the science floor, which had all sorts of exciting interactive things to do. It was also there that I used my first PC! We found a new part recently added, which was a 'dress up' room in the fashion section especially for kids. There was a big wardrobe with play clothes like we used to have in nursery school (kindergarten). Sam put on a spacesuit and chose the moment a group of textiles students were passing through to yell: "Carla, look! I've always wanted to be in NASA!" Anyhoo, I had to get a picture in my regular clothes now didn't I? POINT OF FASHION: Granny chic. 1: In a maid's costume - I think I'm missing my vocation! Of course I loved the Peter Pan collar. 2: Sam meeting her clones in the kaleidoscope mirror. 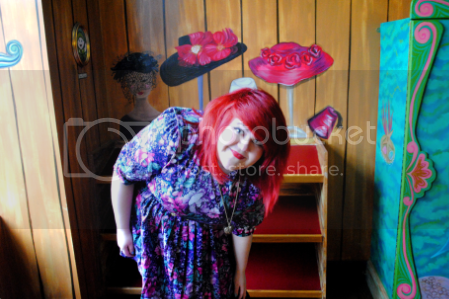 3: I loved these hats painted on the wall - the little fez is so cute! We also found the most amazing little café tucked away, but I'm saving that for another post where I'm going to write about my favourite hidden gems in Newcastle. So stayed tuned for that! Aw I absolutely love this outfit!! You look stunning. I love your dress - it really suits you. Oooh, I love museums more than life. They're so much fun. You look so amazingly gorgeous,darling! Granny Chic! I luuuurrrvvvve it! I love all the colours in your dress. I love museums. In my country there are so many wonderful and fascinating museums, that reminds me I need to find some time to visit one of them. You are rocking that dress. I love the way you modernize vintage pieces. The other day I was out thrifting and saw a dress similar to that (sadly, not in my size) and thought, "that looks just like something Messy Carla would wear!"! You look adorable! I love going to museums as well.The pic of your friend is funny and I love that you commented on the peter pan collar of the maid's outfit. Fun post! That dress is awesome carla! Also love your little maids outfit heheh. 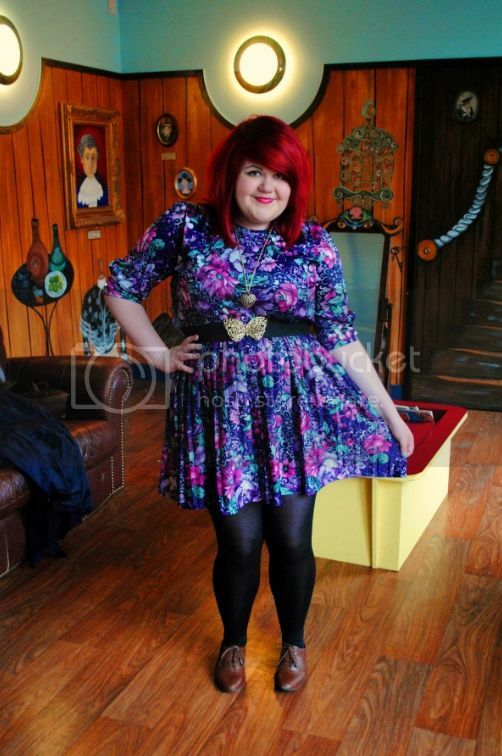 Everytime I see that dress, I think what bright brilliant colours they are! Oh I just love your dress!